Twice a day you ask your child if he has brushed his teeth, and twice a day he insists that he has. Unfortunately, many kids aren't completely honest when it comes to their oral health habits, and since they don't fully understand the consequences of failing to care for their teeth, they probably don't see why it is such a big deal. So, aside from waiting until his next dental appointment, how can you find out if your child is really brushing? Make sure that your child is brushing his teeth at the same time every night. Some parents establish the brushing time to be right after dinner when their kids aren't too tired to skip out on it. This could also help to reduce night time snacking. Another good way to make sure your child is brushing is to brush your teeth along with him. Make family brushing part of your new routine, and tell your child to imitate what you do. While you might not find it convenient to brush your teeth at 7:00 at night, you'll be instilling good habits with your kids while ensuring they are brushing properly. It will be a lot easier for your child to be less than truthful about his brushing habits if he brushes on his own with the bathroom door closed. Keeping the door open provides the danger that you might walk in and catch him cheating. Encourage your child to belt out his favorite tune while he is singing. He won't be able to try and sneak one by you with fake brushing if you have a good look at his mouth. 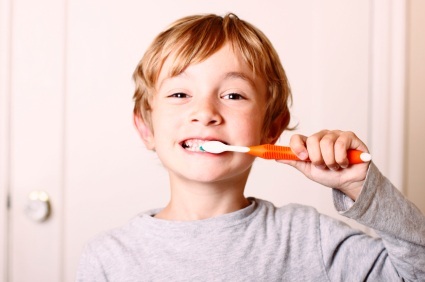 Do you need extra tips on how to encourage better brushing? Contact our office today.